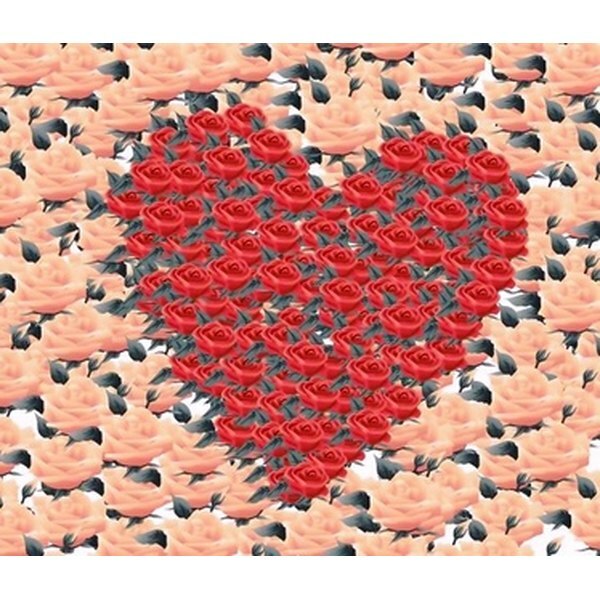 A heart of flowers represents beauty, romance and love. A heart-shaped bouquet is a romantic and traditional floral accessory for the bride to carry down the aisle. This type of bouquet requires much concentration and planning to ensure the final product will look professional and stylish. The heart shape reinforces the love and beauty of the day, and will complement the wedding decor even after the ceremony when it's time to toss the bouquet. (Unless the bride decides she cannot part with her creation). These bouquets can be built on bouquet holders, but the process is more stable and professional on floral foam. Sketch out how you want the final bouquet to look. Make notes of the flowers you will use and where they will go in relation to each other. For example, if you are using roses and baby's breath, draw the roses in the center and the baby's breath surrounding them. Make a note of colors especially to ensure the final bouquet looks professional and complete. Fill the bucket with water and place the floral foam inside. Allow it to absorb as much water as possible by leaving it to sink to the bottom. When it sinks, it has absorbed the maximum amount of water. Remove the floral foam from the bucket and lay it down on a clean, flat surface. The plastic holder on the back will place it at an angle you can use to your advantage while designing the bouquet. The reason why the foam is wet is to keep the flower moist, same as being put into a vase with water. Cut the stems of the flowers to 3 inches so they will not stick out the back of the foam. Cut the ends at an angle to make a sharp point. Make sure all are the same length so no bloom projects out farther than another. Hold the floral foam steady and pierce the foam with the end of the floral stem. Begin at the center and work your way outward to ensure there are no gaps in your arrangement. Pierce the foam and push each bloom in all the way so only the petals show, with no stem visible. Continue this process with the blooms tightly packed together. The floral foam can also hold flowers around the edges. Once the front has been designed, add flowers all around the edges and around the lip toward the back using your paper design for guidance. This will make the bouquet look full from all angles, even if someone is behind the bride. Inspect the heart-shaped bouquet to ensure it looks full and complete. Fill in any gaps that may have been missed. Hold the plastic holder in your hands and look into a mirror to make sure the bouquet looks full from all angles. Ask for a second set of eyes to check for bald spots. Heart-shaped bouquets are lovely, but can be seen as more traditional. To spice them up, consider using non-traditional flowers like sunflowers or gerbera daisies in this floral arrangement for a different take on the tradition. 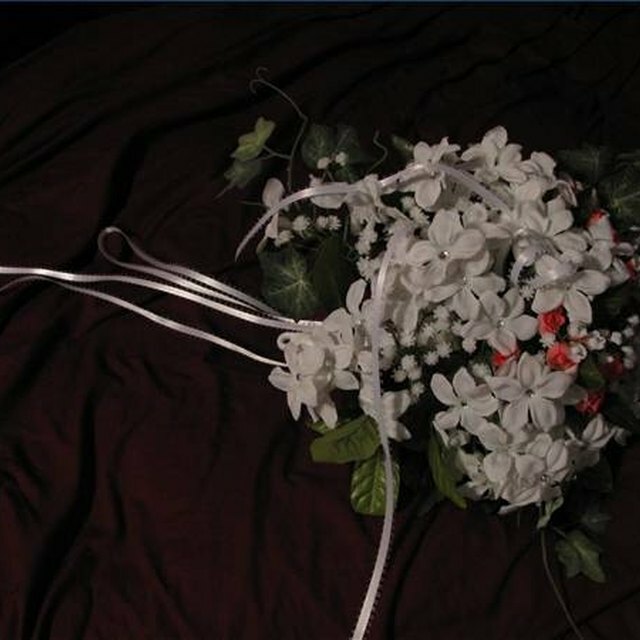 Floral foam does not have to be wet if you are using artificial flowers, although the rest of the steps remain the same. Be careful when piercing the floral foam so you do not slip and potentially harm yourself with the sharp tip. This is especially relevant for artificial flowers where the stems have floral wire embedded in them for bending.